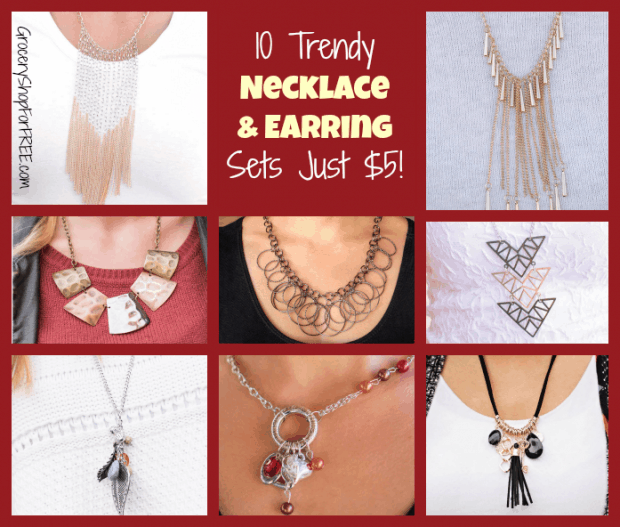 10 Trendy Necklace & Earring Sets Just $5! 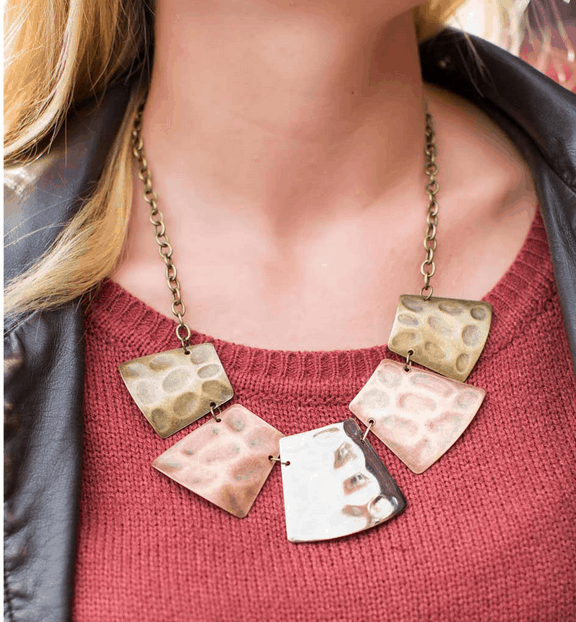 You are here: Home / Great Deals / 10 Trendy Necklace & Earring Sets Just $5! 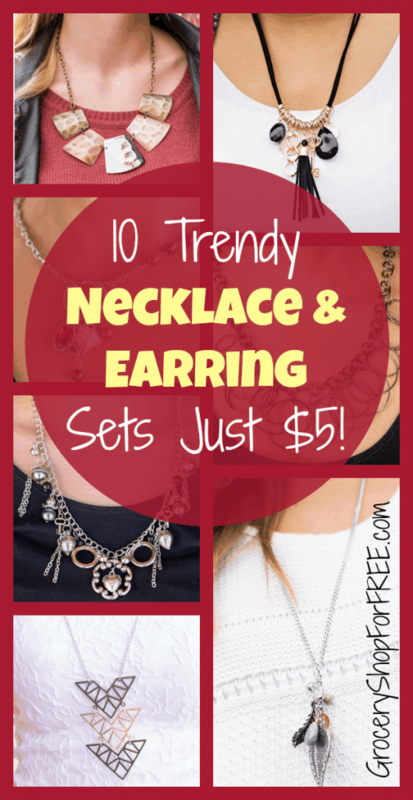 Check out these Trendy Necklaces that come with a FREE pair of matching earrings – I love them! I am really loving all of these $5 pieces from Paparazzi! They have new stuff almost everyday! From Hair Bows and Headbands, To Earrings and Necklaces and more! 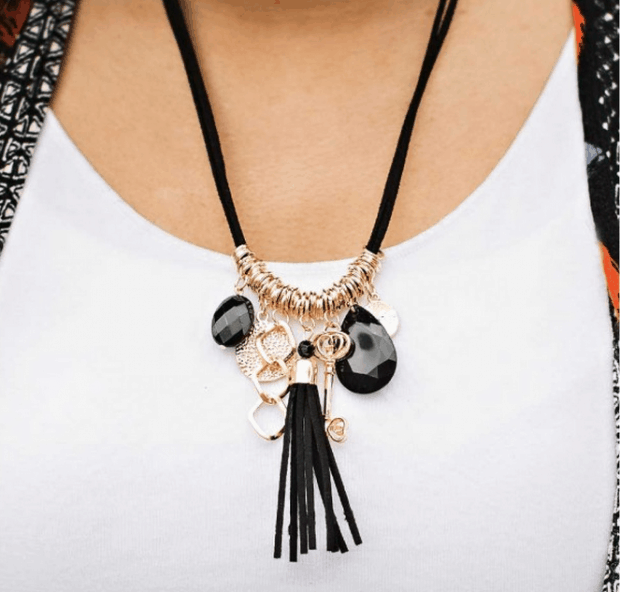 A tassel of black suede is centered between shimmering gold accents and dramatic black teardrops on a strand of black cording. 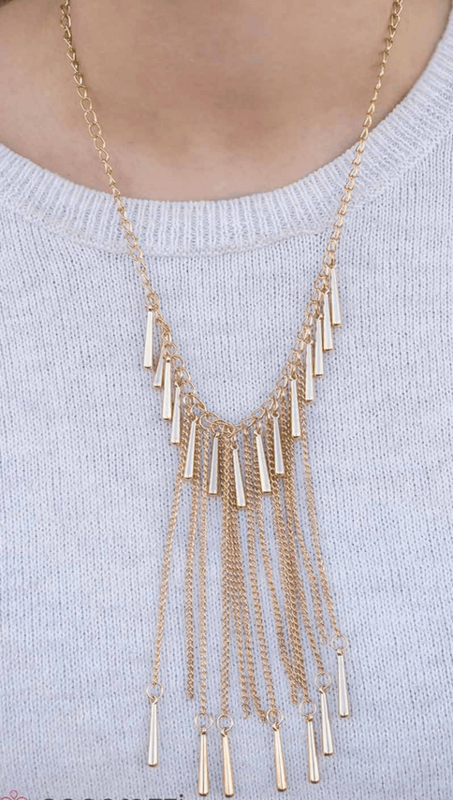 Gold accents include a key, chunky gold links of chain, and gold discs hammered with texture. Features an adjustable clasp closure. adorning one side of the chain for a beautiful asymmetrical look. Features an adjustable clasp closure. 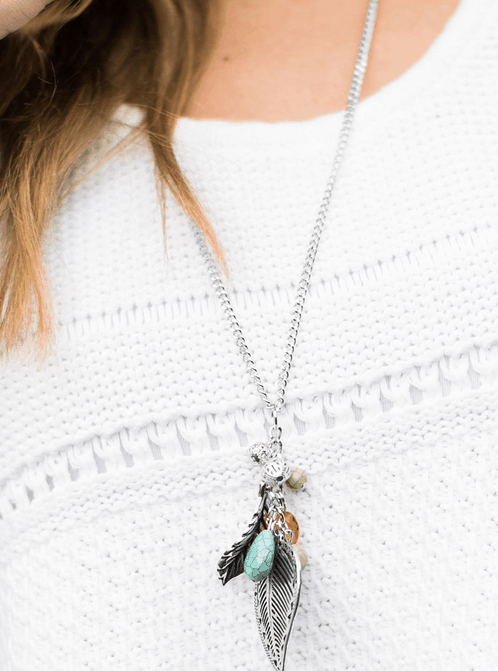 A cluster of nature-inspired charms swings at the bottom of a long silver chain. earthy green beads in a faux rock finish, a silver feather, and an airy silver leaf. Features an adjustable clasp closure. silvery-gray pearls, and tiny silver charm accents. Features an adjustable clasp closure. that creates a fearless statement piece. Features an adjustable clasp closure. Long gold beads lengthen countless gold strands and accent a shimmering gold chain. 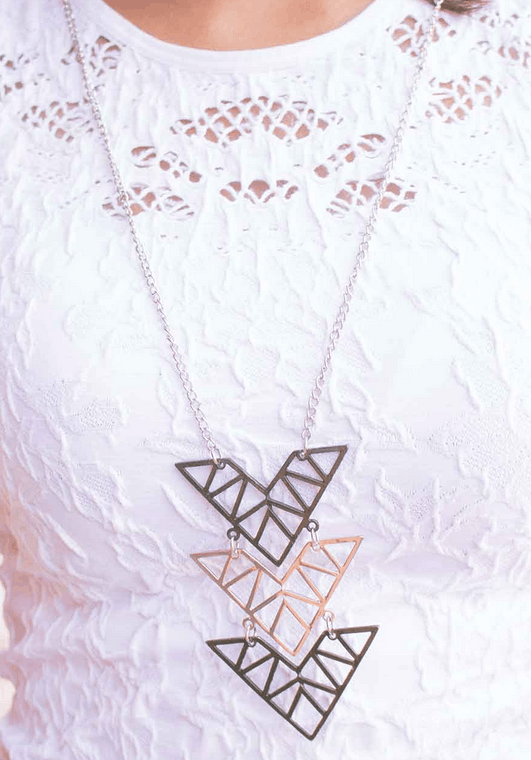 Airy geometric arrows in the fall Pantone of Cypress and silver descend on a long silver chain. in the center creating the perfect statement piece. Features an adjustable clasp closure. A thick silver hoop is the anchoring piece for a collection of silver charms and harvest-toned beads to sway. Charms include a heart etched with the word, “Love”, an oblong ring, a curved leaf, and an airy heart. 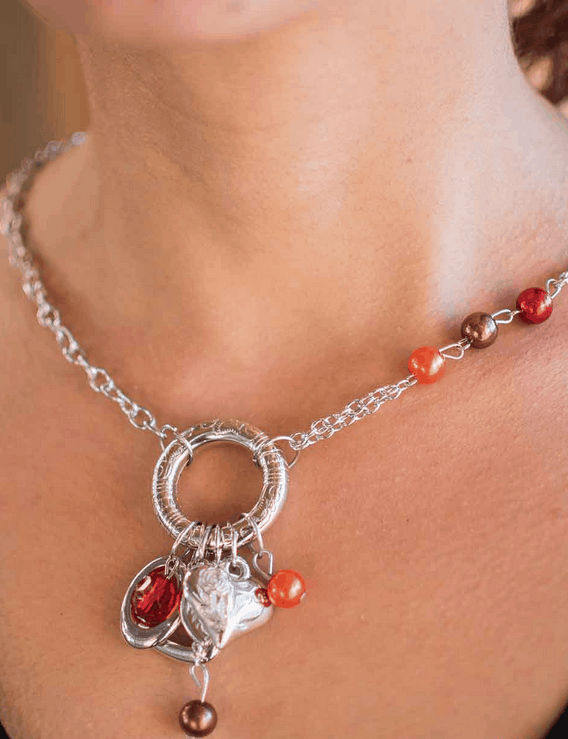 Three beads in a pearly finish climb one side of the neckline, adding abstract elegance to the piece. 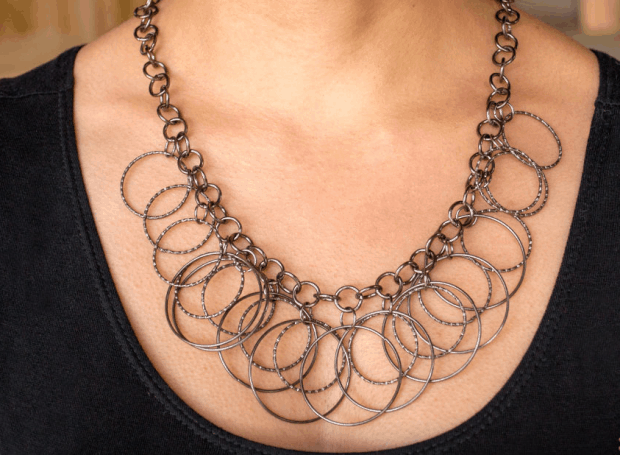 Countless gunmetal rings dance along the neckline in this beautiful statement piece. Each ring is etched with light-catching texture, adding depth and sparkle to the design.